To start our trip, we jumped in the car on a Thursday afternoon and headed up to Aspen. If possible, we’d highly recommend avoiding doing this hike on a Saturday/Sunday, as the crowds can get a bit heavy in the summertime. We were able to manage a Friday/Saturday trip, and were glad to be headed the opposite way of the nearly-nonstop parade of hikers headed to Crested Butte on Saturday. We knew we wanted to camp near the Maroon Bells trailhead prior to starting the hike in order to save time in the morning and also avoid the insanely priced hotels in Aspen. There are several campgrounds around Aspen, and we ended up staying at Difficult Campground. You can reserve the Difficult Campground and several other Aspen area campsites here. Despite what its name might suggest, this campground was easy to book and a lovely place to spend the night. 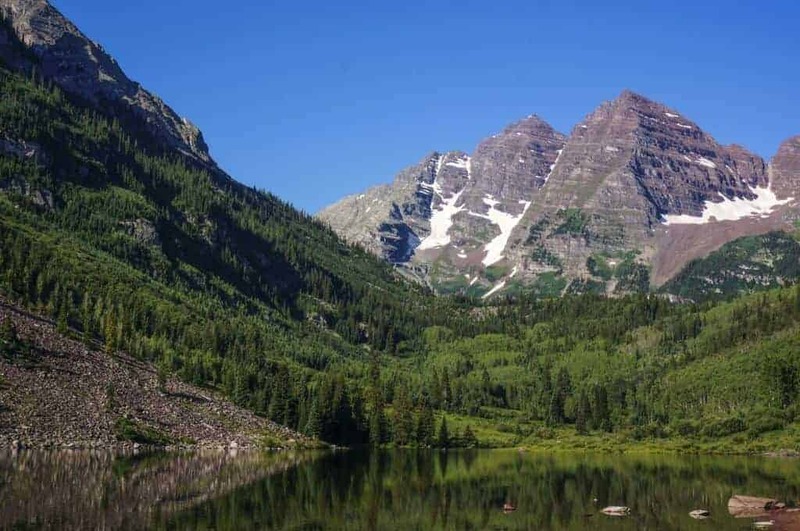 We recommend spending the night in Aspen ahead of your hike as you’ll be able to get an earlier start and have a better chance of getting a parking spot at Maroon Bells. We wanted to get an early start on the trail, so waking up at 4:00am to try and secure a coveted parking spot in the overnight lot at Maroon Bells seemed like the best plan of attack. We headed to bed early, knowing that 4am comes quickly! Upon arriving at Maroon Bells a little before 5am, we found the overnight parking lot full (with lots of people clearly camping near or in their cars, which is not technically allowed). Bummed to be beaten by the rogue campers, we treated ourselves to a coffee in town and then headed to the parking garage at Aspen Highlands to catch the first bus to the trail head at 8am. 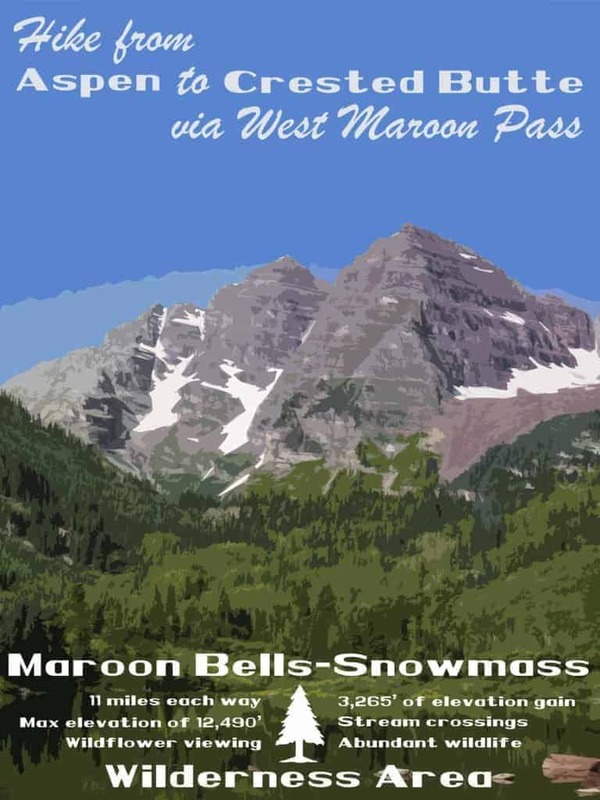 If you’re looking for more info on the parking situation at Maroon Bells we have a detailed description here. We opted to tackle the hike via the West Maroon Pass option, an approximately 11-mile hike from start to finish. We found the trail wasn’t especially arduous, but rather long with one very steep section near the top of West Maroon Pass. The trail also has several stream crossings, so be sure you are prepared with sandals of some type to navigate the frigid, rocky streams. The approach to West Maroon Pass from the Aspen side is a beautiful walk through a long valley that highlights the quintessential character of this area. 14,000 foot peaks surround you as you make the long approach to the pass. About 3/4 of a mile before reaching the top of the pass, the trail steepens sharply and you’ll begin the ascent to the summit in earnest. 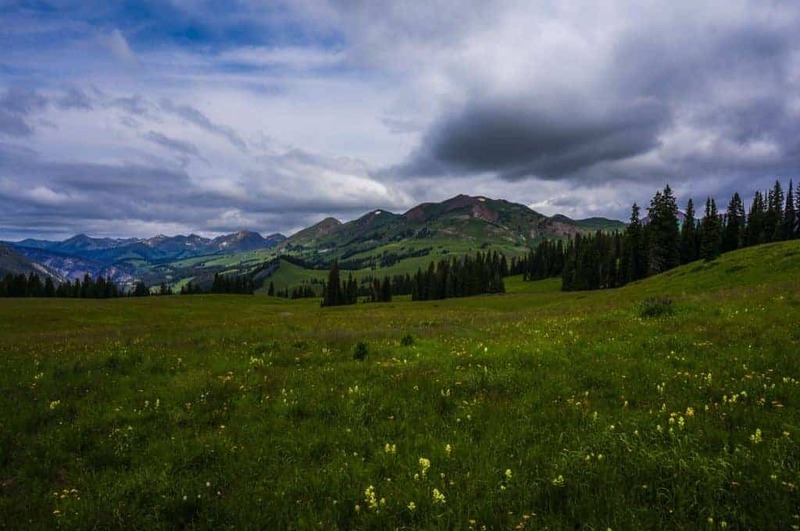 Once you’ve made it, you’ll enjoy spectacular views back towards Aspen and down into the Crested Butte area. Several stream crossings required careful attention. Views from the top of West Maroon Pass. The decent to the Crested Butte trailhead is full of some of the best wildflower viewing in all of Colorado. We were amazed at the seemingly endless array of colorful flowers blooming. If you’re able, we’d highly recommend hiking the trail in late-July or early-August, given the incredible wildflowers that time of year. 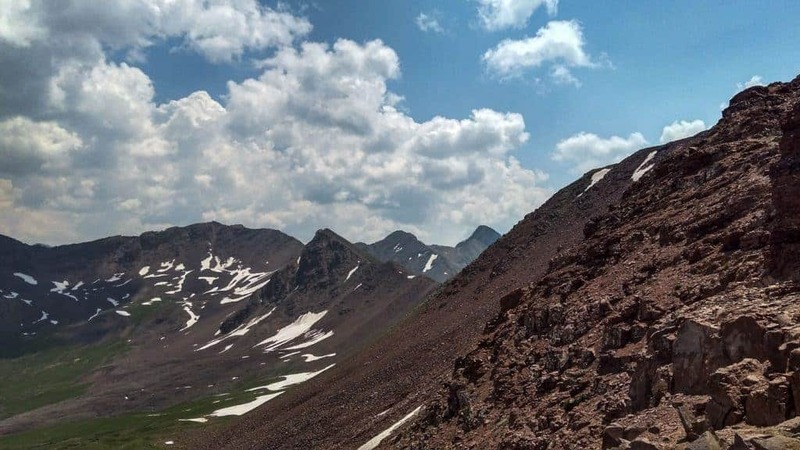 Overall, the trail down to Crested Butte is fairly mellow, with the exception of a very steep section immediately after the summit of West Maroon Pass. After a long, meandering walk through the sea of wildflowers, we found ourselves at the West Maroon trailhead on the Crested Butte side where we had arranged to whisked into town by Dolly’s Mountain Shuttles. Unfortunately, Dolly’s proved to be very unreliable, and we ended up hitching a ride from some friendly hikers instead (and getting a refund from Dolly’s). We spent a lovely night in CB and enjoy post-hike beers and excellent pizza at the Brick Oven. The next morning we were shuttled to the trailhead by a local Crested Butte friend. Rather than getting dropped of at the West Maroon trailhead, we opted instead to start our hike on the 401 trail (a little closer to town) in order to see some different trails in the area. The 401 is the quintessential mountain biking trail in CB, and it was fun to see all the cyclists huffing and puffing their way to the top. Eventually, the 401 forks and you can connect back with the trail that will take you to the top of West Maroon Pass. If you’re interested in taking this alternative, be sure you have a good map and a solid understanding of where the trails merge. On the way back to Aspen, we were surprised by the constant flow of people heading into Crested Butte. It was a beautiful Saturday, and it seemed that the entire town of Aspen had decided to head to Crested Butte for the night. Our hike was once again filled with incredible views, plentiful wildflowers, and the euphoria that comes with spending a day outside in the Rocky Mountains. We arrived back at the Maroon Bells trailhead by mid-afternoon, and hopped on the shuttle bus back to the Aspen Highlands parking lot. We then drove to Carbondale for the night, where we enjoyed a lovely B&B, some delicious Mexican food, and a few beers to celebrate our successful trip between Aspen and Crested Butte! Want a sweet souvenir from your hike? Check out our art prints!